The Apache Point Observatory Galactic Evolution Experiment (APOGEE) spectrograph is the latest addition to the Sloan Digital Sky Survey III (SDSS-III), and is set to catalogue the motions and chemical compositions of over 100,000 stars that span nearly the entire age of the Universe, 300 at a time. APOGEE has already observed 32,000 stars in the first six months of operation, more than four times as many stars as have ever previously been observed in such detail at near-infrared wavelengths by all of the world’s telescopes combined. Near-infrared observations give astronomers the ability to see through thick dust that shrouds many stars from view, including previously unseen phenomena in the heart of the Milky Way and right through to the normally hidden far-side of our Galaxy. This “first-light” field of stars observed by APOGEE focuses on the constellation Cygnus, which is filled with Milky Way stars, star clusters and dust (seen as coloured, glowing clouds in this background image from NASA’s WISE infrared observatory). The large white circle is the field of view of APOGEE, with a width spanning six Moon diameters. The green circles indicate known or suspected young star clusters. The small red circles indicate the position of each faint star targeted by APOGEE. The inset shows pieces of the APOGEE spectra for stars determined by APOGEE to be members of two of the clusters indicated, identified by the near identical motions through the galaxy shared by each clusters’ stars and detected as shifts of the spectral features caused by the Doppler effect. These dark line features are caused by absorption of specific colours of light by the atoms of the different chemical elements in each star. Image: P. Frinchaboy (Texas Christian University), J. Holtzman (New Mexico State University), M. Skrutskie (University of Virginia), G. Zasowski (University of Virginia), NASA, JPL-Caltech and the WISE Team. 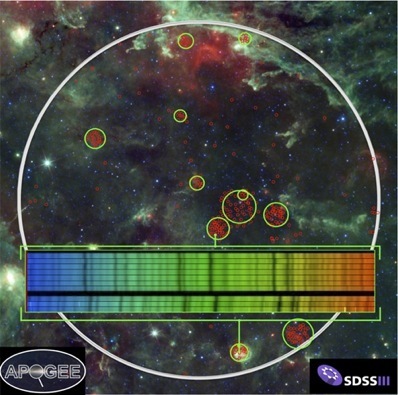 By mid-2014, the end of its first three-year survey, APOGEE will have acquired precise motions and the abundances of fifteen chemical elements, including carbon, nitrogen and oxygen – key building-blocks for life – for tens of thousands of stars in the Milky Way Galaxy. Impressively, it can study up to 300 stars in one helping. Anticipated results from APOGEE include the ability to discriminate between stars born and traveling together in clusters, or those that were pulled out of the same star system and consumed by the Milky Way during a past merging event. The survey will also reveal how the chemical compositions of stars change with their ages and locations in the Galaxy, providing detailed insight into how our Galaxy and its planets – and ultimately life – came into existence.